These designs are made for people who love watching the birds in their own backyard. Feed the birds, water the birds, house the birds, love the birds, watch the birds! 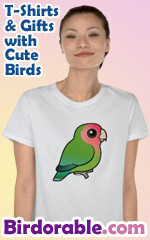 Original gift ideas for backyard bird lovers! You know who gets on my last nerve? Squirrels that destroy feeders, scare off feathered friends & wolf down seeds. This backyard birds design features eleven yard favorites perched or flying between the text. Cute! If you feed the birds at the drop of a hat, does that make you easy? Don't worry about where you park, just go ahead and feed the birds. Great for people who love to feed the birdies! Everyone knows that backyard birders aren't always fond of squirrels. But what do the birds think?